Lord of the Night reviews the dark, thrilling Witch Hunter omnibus from the Black Library, written by C.L Werner. Across the Empire no men are more feared then the the Templars of Sigmar. Better known as Witch Hunters they roam across the Empire fighting the forces of Chaos, no matter where it rears its head. Even the most fearsome of the Dark Gods servants quake when the temple’s chosen come to dispense the justice of Sigmar. And amongst these mighty witch killers, one is renowned across the Empire. Known for his fearsome deeds and piety to mighty Sigmar, Mathias Thulmann is a bulwark against the darkness. The omnibus starts with an introduction by Mr Werner himself where he talks about Mathias Thulmann being his first character created for Black Library, his love of halloween, and the influences of Vincent Price’s Anthony Hopkins and Robert E. Howard’s Solomon Kane when creating Thulmann. 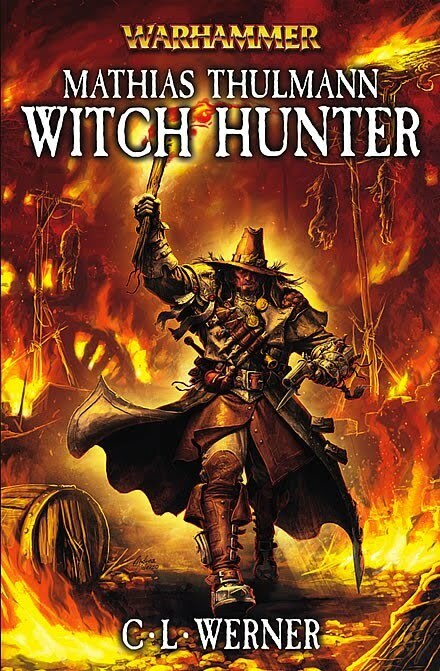 The series itself consists of three novels, from first to last these are titled Witch Hunter, Witch Finder and Witch Killer, along with three short stories added in, one of these created especially for this omnibus. A Choice of Hatreds, Meat Wagon and Witch Work. The first novel contains its own story and sets up the scene for the next two books, while the short stories are set before the first novel, and the last short story Witch Work serves as a direct prequel to Witch Hunter. The characterization is well-shown in the series through good writing and a health dose of contrast. Thulmann is a pious servant of Sigmar who stands against the forces of Chaos in all its forms, but is caring and does recognize that his kind are not popular in the Empire and tries to avoid harming innocents in his duties. While his partner/henchman Streng is a drunken, greedy whoremonger who very much enjoys his work as Thulmann’s torturer. The contrast between these two exemplifies the characterization of each of the two and provides a good amount of humour in the series. The remaining characters are all very varied and provide valuable allies and dangerous enemies to Thulmann. Some of these characters include Captain-Justicar Ehrhardt, a dour knight of Morr, Lady Silja Markoff, a strong-willed ally to Thulmann, the mad scientist Doktor Freiherr Weichs, or the devious necromancer Carandini who serves as an antagonist throughout the series. A strong base of characters remains in the entire series while new characters introduced in each book allow for new interactions and situations to occur. The action scenes in the series are very well-written. Thulmann despite being brave and possessing a fearsome array of weaponry frequently faces enemies far more powerful then he, such as deadly vampires, fearsome Daemons and even the nightmarish myths of man in the flesh. Thulmann opposes them all with his blessed sword, twin pistols and assortments of holy water and symbols of Sigmar. With Streng at his side, and Streng’s trusty crossbow, the fighting scenes vary from small to large and are all written well, whether its a short brutal fight against those who under-estimate Thulmann, or a large battle against the mad servants of the Dark Powers. The pace in the series is quite well done. C.L Werner creates many twists and turns in the story, surprising the readers and doubling their interests in the novels. Going from a slow reading pace the series can explode in an instant into fast-paced action or chase scenes, Werner does them all well. The omnibus ends with Witch Killer but the series is far from finished. C.L Werner has told me that he wants to get a new series of Thulmann novels started, and that they are one of his future projects. But the ending of the omnibus was action-packed, ominous and heart-warming all at the same time. 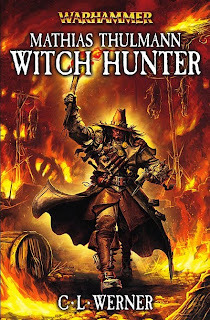 My rating for Mathias Thulmann Witch Hunter is a deserved 9/10 for a memorable cast of characters, both hero and villain, plenty of surprise twists and a great portrayal of the dark world of the Witch Hunters. I highly recommend this book, and if you have any doubts about buying this omnibus, see the quote at the top of this review. That should alleviate your doubts.